This June, we’re finally bringing back One LibraryThing, One Book. June being LGBT Pride Month, we wanted to join in the festivities with our OLOB choice. I give you The Night Watch by Sarah Waters. 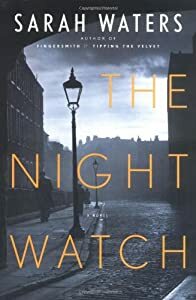 Shortlisted for the 2006 Man Booker Prize, The Night Watch is set in 1940s London during and after World War II. The story follows the disparate lives of five main characters during this period, and the secrets they have in common, although their experiences are different. Since it’s been a while, here’s a quick refresher on how One LibraryThing, One Book works. To participate, be sure to join the One LibraryThing, One Book group. That’s where all discussion will be taking place. Say “hi” on the “Introduce Yourself” thread, or tell us what you think as you read over on the “First Impressions” thread. We’re going to do things a bit differently this time around. Official discussion for The Night Watch will kick off Monday, June 1st at 12pm Eastern. I know that’s nowhere near enough time for readers to have already finished the book—we’ll be breaking this one up into chunks. On June 1st, we’ll only be discussing the book and the events therein through Chapter 3—the 1947 section. LT Staff will be posting a few starter questions right before 12pm that day, after which point the floodgates open and other members are welcome to post their own questions and discussion topics. If you’re disappointed we didn’t give members the option of voting on this OLOB pick, don’t worry. We’ll be bringing back voting for future OLOB reads. We just wanted to get this one off the ground quickly. You can also find more information about what inspired OLOB in our original introductory blog post, and you can see past selections by hitting the One LibraryThing, One Book tag on the blog.